While I’m not big on inducing panic, I have been hearing some rumblings on the news and online lately about being wary of giving gift cards this holiday season. And because I think that this information makes sense, I wanted to share it with you. It should come as no surprise that many retailers are struggling right now, and many companies are predicted to be filing for bankruptcy after the first of the year. 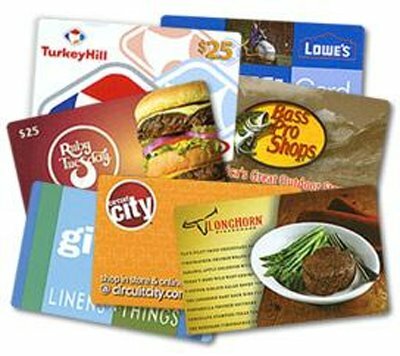 According to Reuters, under current bankruptcy laws, retailers do not have to honor their gift cards once they file for creditor protection in bankruptcy court. That means it would be worth it to think hard about which retailer gift cards you are going to purchase this year (if any) before doing so. I personally love to give gift cards because they are easy and usually appreciated, but this year I think I’m going to try harder to come up with alternative gift ideas for those on my list. And if I can’t come up with any ideas, cash might be the way to go. That is not to say that I’ll go totally gift card free…there are several “big box” and grocery store chains who are still doing well financially, and I am comfortable purchasing gift cards from those stores. It is the “mall” type stores that are going to make me think hardt. Do an Internet search if you are interested in seeing which stores are doing well vs. not so well. It is pretty enlightening. On the up side, we should be seeing some great sales and bargains over the next couple of months, which is yet another reason why consumers will be buying less gift cards this year (according to this article). And if you do give (or receive) gift cards this year, it may not be a bad idea to encourge the recipient of your gift (or yourself) to go out and spend them right after Christmas…just to be safe. What are your thoughts? Gift cards or not this holiday season?